Nobody wants to be an expert at wasting water. First, water is a precious resource. Conserving water is environmentally-friendly and responsible. Also, wasting water can cost you hundreds or even thousands every year on your water bill, not to mention any fines you may have to pay for unintentionally violating Austin water regulations. But, maybe you don’t know where these losses are coming from. Here are some of the main culprits that waste water and eat away at your finances. Overwatering is the biggest detriment to both the health of your lawn and your wallet. There are a number of factors that add to overwatering. The first is your irrigation system. Sprinkler heads should be adjusted to cover your zones evenly while taking into account the drainage of your landscape. If there are low spots, this can cause water to pool in these areas, thus saturating the ground with more water than it can absorb. Alternately, higher ground will lead to runoff, in which case you will need shorter, more frequent watering sessions. If your system is on a timer, it is harder to adjust watering according to the needs of different zones. Plus, the system will continue to water even if it rains unless you adjust it manually. Smart irrigation systems address this problem by adjusting the watering schedule to the local temperature and rainfall. You can also prevent overwatering by installing rain or soil moisture sensors, which will override the automatic schedule. Old or cheap sprinklers are likely to shift over time, resulting in uneven watering or “watering the pavement”. Even better-quality sprinklers will eventually settle and shift, so it is important to observe and adjust accordingly. Sprinkler heads can break, crack, and leak, either because of damage or normal wear. The telltale signs of leaks are pooling water, erosion, runoff, or puddles. Check sprinkler heads, stems, and wiper seals around the stem if you notice any of these signs, and replace parts as needed. It is easy to make the mistake of overwatering if you don’t know how much water your specific plants require and how much your soil can absorb. Trees have deep roots and are able to store water, so they need more. Ground cover and shrubs require less deep watering, but more frequently. Sandy soil has a very low moisture retention and needs more water, while soil with a high clay content takes in water more slowly, retains moisture longer, and erodes more easily. 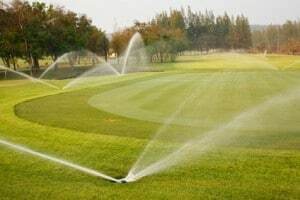 One advantage of upgrading to a smart irrigation system is you can program the plant and soil types into the controller so that watering is adjusted accordingly. Morning is the best time to water. Local Austin water regulations also require only watering on certain days during specific hours to avoid fines. You will accumulate a lot of water waste by watering during the heat of day, as most of the water will evaporate before it can be absorbed. Watering at night, when nature’s moisture settles on the ground, can lead to the growth of undesirable fungus on plants and roots. How sprinkler pipes are connected can make a world of difference. Call the pros at South Austin Irrigation Repair for expert work. If you are thinking about making a few changes to your irrigation system that involve connecting plastic pipes to metal ones, you’ll need to be aware of some of the issues to which such connections will give rise. Plastic and metal piping can be combined; but you have to be careful how you go about doing so. You will make your plastic to metal linkage with threaded connections. Use a plastic male thread to connect to the metal female threads. If you do the opposite—use a plastic female threaded connector with a metal male connector—the new joint you create will either leak or break. This is because polyvinyl chloride (PVC) plastics stretch far more easily than metals do. A female PVC fitting joined together with with a male metal fitting will tax the female fitting to the point where it will crack and leak. It’s also important to know that the standard threads used on pipes and fittings are not uniform in diameter. The reason for this is that as the threads are screwed together, the male fitting gets compressed while female fitting stretches. This results in a very tight joint that won’t leak. When creating plastic to metal threaded joints, you’ll need to use a sealer/lubricant. Doing so will help lubricate fittings making it easier to screw the mail and into the female: it will also help seal the joint and guard against leaks. 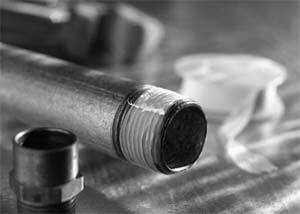 Three products you can use for this purpose are Teflon pipe dope, Teflon tape or PTFE tape. If you are working on pipes associated with a sprinkler system, Teflon or PTFE tape are the two best choices because your pipes could carry pipe dope residue into the sprinklers and clog them up. Irrigation systems need specialized care and attention because the wrong choices could cost you time and money. 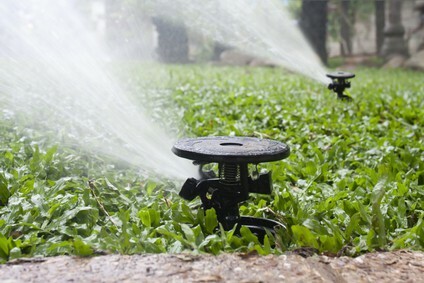 Whether you’re in need of installation or repair/replacement services, the dedicated professionals at South Austin Irrigation can help you maintain your irrigation unit in top condition so that watering can be one less thing you’ll have to think about. Call South Austin Irrigation at (512) 534-7449 for service today. Are your home water line pipes made of copper? Though durable, this type of piping can develop leaks around connections. And pinholes may form in pipe walls, leading to larger breaks. If your copper water pipes are starting to leak, don’t despair. You may be able to simply remove the bad section and replace it with a new one that’s joined to the existing pipe with copper fittings. Trace the water to where it’s seeping out of the pipe. Once you’ve found it, turn off the flow of water to the pipe at the closest main shutoff valve. Using a pipe-cutting tool, cut away the leaking section of pipe. Make sure to cut the pipe a few inches away from the leak and on each side of it. Sand the ends of the pipe with an emery cloth until shiny then dry them. Slide couples on each end of the cut pipe. Measure from the middle ridge of each coupler with a measuring tape to determine the length to cut the replacement coupler. With measurements in hand, cut replacement pipe and sand ends with emery paper until shiny. Brush one end of the replacement pipe with flux so that about one inch is covered with a thin coating. Slide one end of the coupler fittings onto the fluxed end of the pipe. Using a torch, heat the area where the pipe and coupler are joined until you see the flux begin to run and drip off. Apply solder to the joint on the opposite side and work your way around the connection. Allow the heated pipe to draw the solder into the connection: this will seal it. Repeat this step to attach the remaining coupler to the other end of the replacement copper pipe. Apply flux to one end of the existing copper pipe. Slide one end of the replacement pipe, with its coupler, over this fluxed end of pipe. Solder the fitting and pipe together with your torch. Apply a thin layer of flux to the end of the remaining copper pipe. Pull and twist the remaining end of the existing copper pipe gently until you can slide the coupler over the end of the existing pipe. Solder this connection together. Turn water back on and test for leaks. At South Austin Irrigation, we’re here to help maintain all parts of your landscape watering system. Whether you need pipe repair or replacement, sprinklers or sprinkler parts, we’ve got what you’re looking for. Contact us today! It happens. You don’t make it a habit to keep your irrigation system well maintained and soon, it gets covered in soil, buried under tufts of grass or hidden beneath overgrown shrubs. This can become a problem, especially when you find you have to locate hidden valves. Learning the common installation locations of irrigation valves and searching those areas can allow you to find the valves you may need to service. Another, more work-intensive method is to trench around a sprinkler supply line and follow water pipes to their source. Search around the electrical sprinkler timer’s control panel for low voltage wires. Low voltage wires are usually thin, multi-colored, braided wires similar to thermostat wires. Find the exit point, knowing that timers mounted inside garages and sheds penetrate through a wall to a building’s exterior. Once you’ve located the exit point of low voltage wires, follow their path along the ground. If the wires are buried, find the wires’ path along the ground. If the wires are buried, find the path by digging around with a shovel. Follow the wires to the solenoids, which are typically thick, black cylinders OR until they enter a concealed irrigation valve box. Insert a screwdriver into the valve box’s removal slot. If necessary, use a screwdriver to pry the box lid from the body. Walk around the outside of the home or building, searching the ground at the perimeter areas for protruding cylindrical valves, valve handles or irrigation valve boxes. Go to the perimeter of your property, scanning the edges for valves, valve handles or valve boxes. If you step on a hard surface, check with a shovel to see if you actually hit against plastic. If you do, dig around it to reveal the hidden irrigation valve box. If your property is overgrown with weeds, grasses and shrubs, trim everything back. Afterwards, scan the perimeter of the building for ground surface anomalies such as depressions or hard spots. Inspect areas by gently probing them with a screwdriver or shovel. If you find either metal or plastic, dig around the area to reveal hidden valves. South Austin Irrigation is here to help you with all your watering system needs. Contact us today! Are you thinking of digging up your yard to install an underground sprinkler system? Advanced planning is key to helping you avoid making unsightly mistakes. This is especially true if you opt for manual installation. Once you’ve determined where you plan to dig your trenches, cut some string to the exact lengths of the irrigation lines you plan on installing. Lay them down in the yard where you plan to dig. Next, tag each future sprinkler site with a flag. This aids in trenching because it reinforces the digging path in case the string moves. Insert a hand shovel into the ground and underneath the grass or sod where you plan to trench. 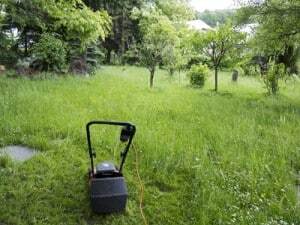 Separate the grass from the dirt below, then peel it up in large sheets and set it on one side of the trenching area. Repeat this step until all sod from the trenching areas is removed. Using a spade, dig up the dirt or soil and lay it on the side opposite to the one where you put the uprooted grass. Dig the trench to a depth of between 8 to 18 inches. Because Austin typically experiences mild freezes, you can dig your trenches on the shallow side. For each area where you plan to lay down a sprinkler line, repeat steps 1 through 3. At South Austin Irrigation, we know your landscape irrigation projects are important to you. Whether you need system repairs, upgrades or replacements, our experts are here to help you every step of the way. Contact us today!